We're excited for the film! (SPOT.ph) IndyBest, a user-generated section under British website The Independent, published a list of eight books on January 17 which they consider as the best in Southeast Asia. Contributor Emma Henderson included "a mix of new releases and some older titles that have become classics of their genre," such as Preeta Samarasan's Evening is the Whole Day and Viet Thanh Nguyen's The Sympathizer. Joining the ranks of these contemporary novels is Smaller and Smaller Circles, a Filipino crime novel published by Soho Press in 2015. It is expected to come out as a film sometime this 2017. Written by F.H. 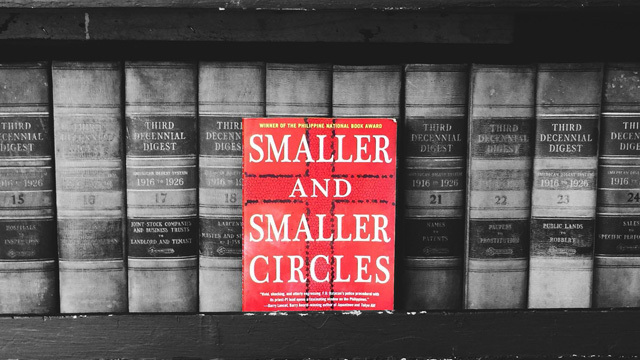 Batacan, Smaller and Smaller Circles started out as a 35,000-word manuscript that won the 1999 Carlos Palanca Memorial Award for Best English Novel. It was first published as a novella in September 2002 by the University of the Philippines Press, and went on to win the Madrigal-Gonzalez Best First Book Award and the Manila Critics' Circle National Book Award for Fiction. Can't blame them! You can't put down this book once you start.